The crudeness of the presently available environmental data has strong symbolic value, and its possible representations should reinstate the awareness of the Global Warming threat, also when enhanced by challenging aesthetic positions. Chris Cheung (a.k.a. h0nh1m) works with audio-visual representation of controversial data and in “CarbonScape” he uses the carbon dioxide levels in the atmosphere, measured and published by NOAA (National Oceanic and Atmospheric Administration), which, they affirm, have reached the highest levels seen in the past three million years. 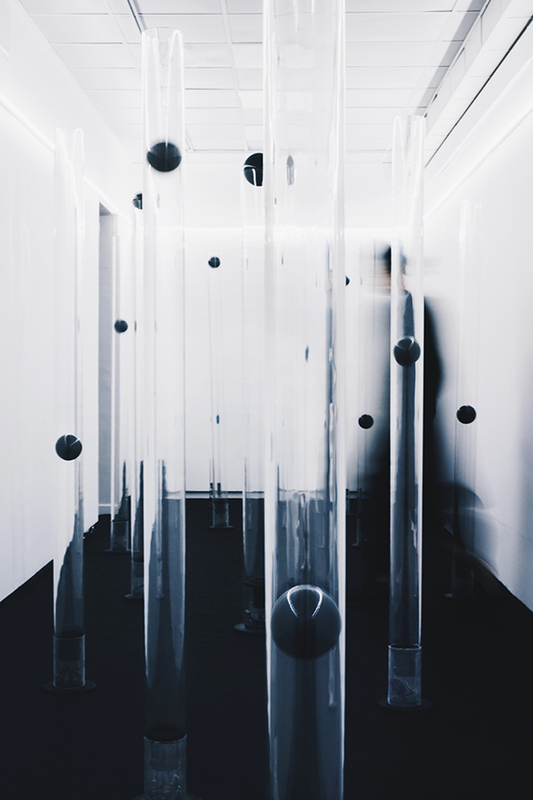 The installation is made of eighteen transparent tubes and black spheres, rising within, while sounds increase in tone and loudness. The sounds are sampled from car and plane engines, factories, ship horns and air conditioner’s humming, reflecting an industrial soundscape. The ‘rising’ can be experienced walking through the tubes, in an aseptic white room. The unpreventable dynamic is visually intense and aurally even more disquieting, hopefully staying with the audience when they leave the room.